ETrade first became famous as much for its funny baby commercials as its top notch trading platform. 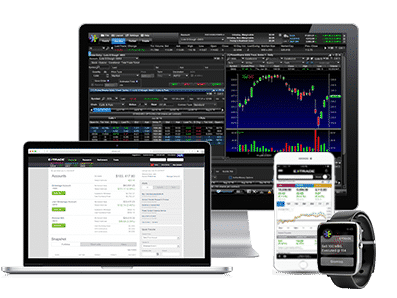 Serious traders will find ETrade’s advertising and marketing prowess is backed up by an impressive trading platform chock-full of cutting-edge stock screeners, excellent customer support, live market commentary, and advanced order execution capabilities. e traders will also find a home at ETrade, which has a reasonable commission structure relative to its competitors and about 2,500 no-transaction-fee (NTF) mutual funds. ETrade trading platform serves a broad range of customers from frequent traders to buy-and-hold investors. ETrade serves beginner traders, active traders, buy-and-hold investors and experienced traders equally well. While its research and advanced charting capabilities don’t compare as well to Thinkorswim, ETrade still offers a combination of no-transaction-fee mutual funds, a broad range of no-commission ETFs, fast and accurate order execution, low account minimums, and excellent customer support to sufficiently please most customers. For regular traders, ETrade offers a web platform with free real-time data and quotes, stock screeners, research and market commentary. For active traders with 30 stock or option trades quarterly or an account balance of $250,000, ETrade Pro offers advanced capabilities, including ideation tools, similar to what’s available freely at thinkorswim. ETrade provides an extensive list of no-transaction-fee mutual funds and no-commission exchange-traded funds for investors as well as customizable charting and ideation tools for active traders. ✅ Caters to Active Traders and Regular Investors: ETrade Pro serves active traders (30 stock or options trades per quarter or $250,000 account balance) with customizable charts and advanced back-testing capabilities. ETrade’s standard web platform provides free streaming market data, watchlists, research, and stock screeners to regular investors. ❌ Higher Commissions: Although ETrade offers 2,500+ no-transaction-fee mutual funds and 100+ no-commission ETFs, its pricing of $6.95 for regular stock trades and $6.95 plus $0.75 per contract for options trades is pricier than many competitors. Active traders do benefit from lower rates but these are still higher than peers, such as TastyWorks. ✅ Mobile Trading App: ETrade has an excellent mobile trading app, perhaps the best in the industry, for both iPhone and Android operating systems capable of easily executing trade orders and screening stocks, options and ETFs. 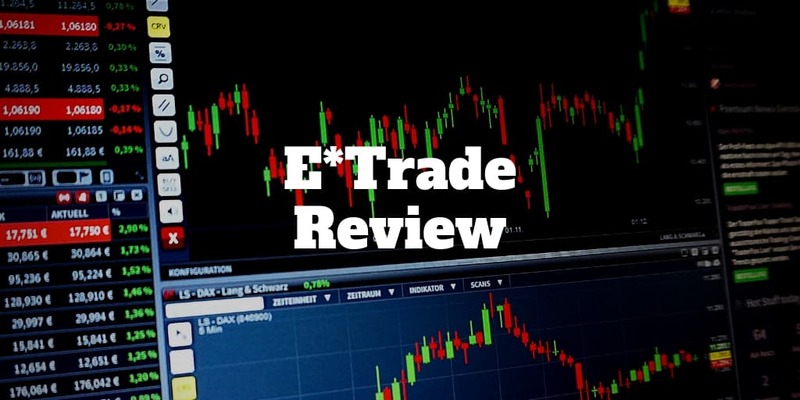 ❌ Limited Access to Advanced Tools: Competitors like thinkorswim provide advanced idea-generating tools freely to customers but ETrade creates a high hurdle to provide similar access to its suite of advanced tools ($250,000 account balance or 30 stock/options trades per quarter). ✅ Customer Support: Beginner traders will find ETrade’s 24/7 phone support exemplary. Email, Live Chat and a wide breadth of educational resources support traders in learning about portfolio management and retirement selections. ETrade also has branch locations that allow customers visit to meet with support staff. ✅ ETrade Robo Advisor: ETrade has launched its own robo-advisor to compete with Personal Capital and Betterment, called ETrade Adaptive Portfolio. Like other robo-advisors, it manages the portfolio for you, adjusting asset allocations dynamically without any manual involvement. ✅ All-Round Broker: ETrade is not directed at just experienced traders but those looking for a full-service offering too. It has an advanced retirement center, extensive education, and an easy-to-use platform. ETrade has fair though not industry-best commission rates and fee structures. ETrade does reward active traders with volume discounts. For traders on-the-go, ETrade provides the standout mobile trading app in the industry. As an all-round platform capable of serving long-term oriented investors, active traders, beginners and experienced traders, ETrade excels relative to its peers. Although it’s Pro features are out of reach for many customers, who may prefer thinkorswim or tastyworks, for similar features, ETrade still stands out from the crowd with top notch customer support, good research, a large range of no-transaction-fee mutual funds, and reasonable commissions.